* Stop #3 of my 2016 Burger Love adventure. Next up in the rotation was the "Blazing 7's" from the West End Bar & Grill at the Red Shores Casino in Summerside. 6oz Island Beef Patty, Scottish Ale Infused BBQ Glaze, Southwest Sauce, Jalapeño Monterey Jack Cheese, Smoked Bacon, Cajun Tomato Salsa, Crisp Onion Rings, and Lettuce on a Craft Beer Bun, garnished with a Jalapeño Popper. 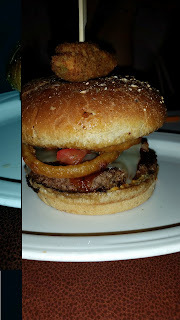 Quite often we'll go to trivia at Red Shores on Saturday night so we decided to try out the burger while there. I didn't enjoy this one as much as their entry last year, but not a bad burger. The patty itself was on the small side but cooked well. I'm a fan of BBQ and bacon so those combined in this one tasted pretty good. Was a little tentative due to the jalapeño cheese since I'm not a big fan of spicy, but it only added a little bit of bite to the flavours.